Rather than repeatedly explaining how to launch each script I write, I’m going to use this post as a generic reference. 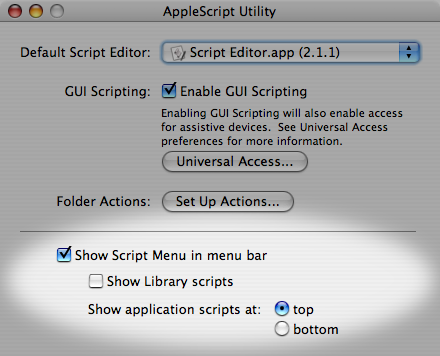 AppleScripts are typically little bits of code that extend or connect your applications’ functionality. As such, they are not necessarily invoked like normal programs. Many fine utilities exist which provide convenient ways to run scripts, including LaunchBar, Butler, QuickSilver, Keyboard Maestro, and others. 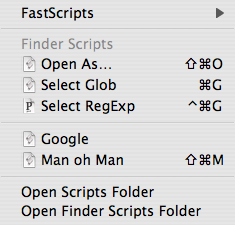 Here, however, I will describe the simple script runners I prefer, one of which is even built in to Mac OS X. Scripts stored in ~/Library/Scripts/Applications/Finder/ are listed in the “Finder Scripts” section, which appears only when the Finder is the frontmost application. Scripts stored in ~/Library/Scripts/ are listed in the unlabeled section and are always accessible. You can create application subfolders for application-specific scripts yourself. The tilde (~) represents your home folder. Here is a video demonstration of the Script Menu. Posted on Monday, September 24th, 2007. 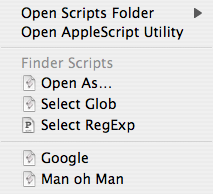 Tags: applescript, fastscripts, mac.